Make sure the rental company is insured, even where it’s not required by statute. Be sure the policy specifically covers inflatable amusement rides and that the limits are adequate. 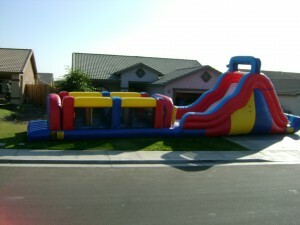 Make sure your operator has a valid certificate of operation if your state regulates inflatables. You can find this by searching online for “amusement devices” on your city, county or state government site. Amusement ride inspection typically falls under the Department of Labor, Department of Agriculture or Department of Public Safety. Investigate the rental company’s safety record. States with jurisdiction maintain extensive records on training and accidents by certified operators. Follow manufacturer safety guidelines. Do not allow adults on rides with children, as the weight difference frequently results in injuries.